Parent/Guardian support organizations work together to improve the culture, curriculum, and academics at King Springs Elementary. PTA: Primarily focused on volunteerism and building the KSE community. Council: Primarily focused on discussing & investigating school issues and, as warranted, advocating for KSE with the district. 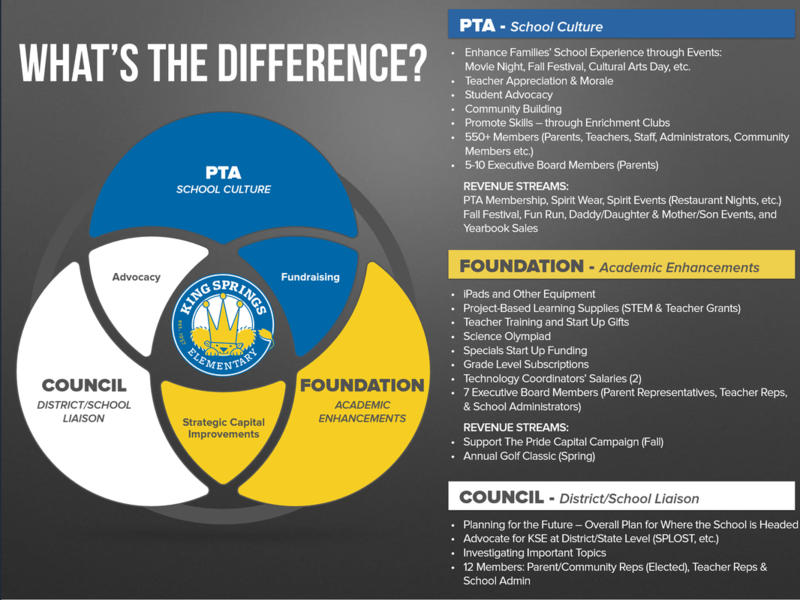 Foundation: Primarily focused on raising funds to implement solutions identified by the school council and to supply resources needed for academic enhancements identified in the schools strategic plan. King Springs is NOT a Title 1 school and therefore is not eligible for supplemental funding that can be use to provide technology and enhanced curriculum. Cobb County School District does not provide additional funds for items and supplies needed to maintain our Cobb STEM Certification and pursue our AdvancEd STEM Certification. KSE's growing two campus system requires innovative solutions to problems and sometimes this means we need to purchase additional resources for equal implementation. A generous and active parent/guardian/grandparent base. A community focused on excellence. Talented Staff and Faculty who actively partner with the school's support organizations.